“Mass media can play an essential role in the preservation of environment in Tajikistan,” stated Karomatullo Olimov, Chairman of the Tajikistan National Commission for UNESCO, in his address to the participants of the training, organized last month in Dushanbe. Entitled “Improving Reporting on Climate Change, Environmental Issues and Biodiversity”, the event was funded by UNESCO’s International Programme for the Development of Communication (IPDC) and British Embassy in Tajikistan. 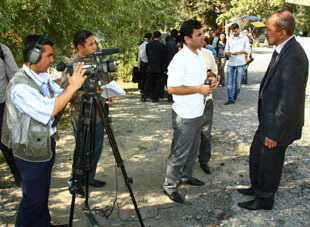 The training was conducted by the Independent School of Journalism “Tajikistan - XXI century” from 21 to 25 September 2010, with the technical support of UNESCO’s Office in Almaty, Committee for Environmental Protection under the Government of the Republic of Tajikistan, Media-Group “Asia-Plus” and Tajik branch of Central Asian Regional Environmental Center (CAREC). Representatives of 18 print and electronic media from all the regions of the country improved their ability in reporting on environmental issues, climate change and biodiversity. According to Mr Olimov, educating the public in ecological issues is crucial for the preservation of environment. “Mass media can play the central role in changing the ways of thinking about natural resources, fresh water, woods and biodiversity that we have in Tajikistan,” he said. Such trainings are very important for raising awareness among journalists on the wide spectrum of environmental issues. The technical director of the local NGO Fondi Kuhiston, Svetlana Blagoveshenskaya, encouraged journalists to actively cooperate with scientists and be exact and careful while covering environmental issues. 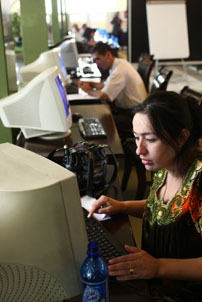 According to her, mistakes in the usage of terminology related to the ecosystem of Tajikistan may undermine not only the image of Tajik scientists, but also the image of the Tajik media. 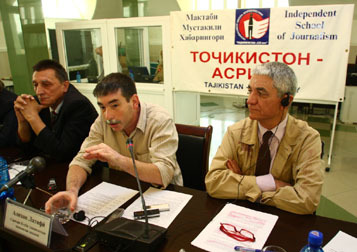 “The main goal of the training was to enhance the ability of journalists in Tajikistan to conduct research and to present balanced and contextualized coverage of environmental issues, as well as of their human impacts. The event also aimed at encouraging media to engage in public debate about improvements that can lead to sustainable development,” said Safo Safarov, Executive Director of Independent School of Journalism “Tajikistan - XXI century”. Participants were provided with notebooks, professional audio and video equipment, as well as access to Internet to help them prepare their stories and media reports. Professor David Mould, Dean of the Communication and Media Arts Department at the Ohio University (USA), acted as a trainer. National experts and outstanding scientists of Tajikistan, representatives of government agencies, environmental NGOs and international organizations made presentations at the training. A trip outside of Dushanbe took place in the framework of the training. It allowed participants to explore areas, where consequences of climate change and human affect on environment were obvious. The information collected during the trip, interviews conducted with experts, representatives of local administration and residents were used for print, audio and video stories that participants prepared as an outcome of the training.